Looking for a new favorite magazine? Look no further! 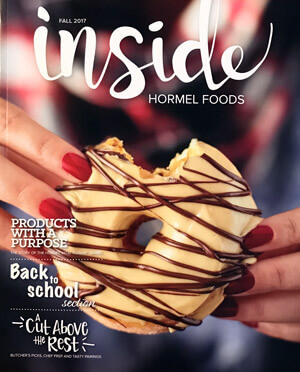 Inside Hormel Foods magazine is a unique collection of thought-provoking and heart warming stories, recipes and features on our employees and the different areas of our company, all packaged up in a beautifully designed digital viewer for you. You’ll find our hot-off-the-press issue at the top, and if you’re hungry for more just keep scrolling down. We roll out a new issue quarterly, so check back in a few months to browse the newest one. Kick back, relax and get ready for a good read ahead. We decided it was time — and it would also be a lot of fun — to have a special issue of our magazine dedicated to everything culinary! From tips and trends to recipes and more, we’ve got it covered. 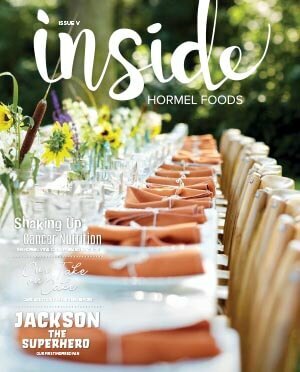 In this issue, you’ll get to meet some of our employees who consider themselves foodies as well as our cultural anthropologist, culinologists and chefs. We’ve also dug into the culinary side of camping, mastering basic kitchen tips like a pro, and so much more. Sit back, relax and enjoy learning more about inspired people and inspired food. One of the best ways to celebrate a new season is by bringing families and friends together, whether in big groups to celebrate the joy of family or smaller get-togethers to enjoy the nice weather outside. 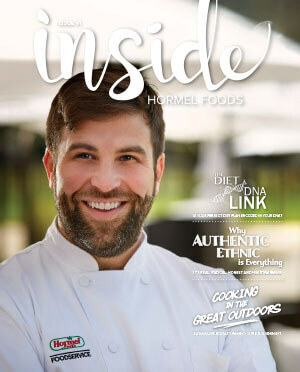 In this issue our employees share their favorite dips, we share all the info you need to start a freezer club, the story of a boy with a special kind of superpower and so much more. Back to school time can be challenging and stressful, but not with this handy collection of stories and recipes. 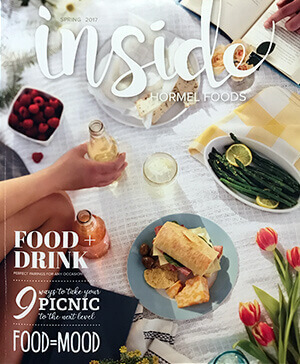 You’ll also find a spread of perfect pairings of meat cuts and complementary side dishes, a deep look at the products we created for cancer treatment patients, some fun info on our pollinator efforts, turkey burger recipes for any crowd, and so much more. Ahh, spring time! Bring in the flowers and fresh air with tips for a perfect picnic, Mother’s Day stories from our employees that will warm your heart, tips for saving time in the kitchen so you can spend more time out of it with the people who matter most, a peek at what celebrities actually eat on a daily basis, and a fun read on how food interacts with the teenage brain. 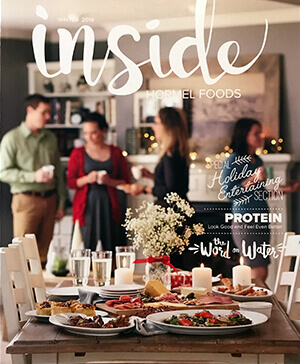 This issue has a special entertaining section to help you prepare for the holidays including easy appetizer ideas, a list of what chefs recommend for perfect holiday gifts, and holiday tradition stories form our employees. You’ll also find an interesting piece looking at the importance of water and the issues our world is facing related to water use, a look at why protein is so important, and a fun, fool-proof case for why you should head to the store instead of the kitchen! 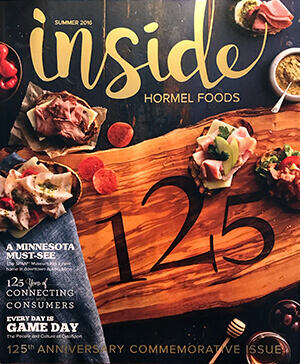 This issue is certainly a special one, it commemorates our 125th anniversary as a company and introduces this publication! Inside you’ll find a broad look at our company and what makes us who we are. Not only will you find stories that celebrate our rich history, but also be able to take a look inside the important things our brands and businesses are doing to stay relevant for the future.